From Wall Street to Main Street the ability to be seen and heard by potential clients is one of the greatest needs and challenges of businesses. And that is why trade shows continue to remain a popular marketing tactic to consider when growing your business, even in today’s Digital world. Why invest in a Trade Show? Trade shows build your brand, generate sales leads, allow you to eyeball the competition, spot trends and grant you valuable face-time with the most buyers in the shortest time, helping you solidify old relationships and build new ones. This strategy may even save you money – according to the Center for Exhibit Industry Research (CEIR), it costs 62% less to close a lead generated from a trade show than one originated in the field. Maximize your trade show activities by putting together a strategic plan with clear objectives and goals for every stage. Be sure to select shows that fit your business. With more than 10,000 trade shows taking place annually in the U.S alone, you are not short on choice. The Internet also offers a ton of information; but don’t forget to reach out to your industry trade associations, local Chamber of Commerce, Convention Bureau and current customers to get recommendations. Remember the best trade show planning will be fail if nobody knows you are going to be there. The CEIR estimates that as many as 3/4 of attendees decide which booths they want to see before they even get to the show. This is the reason you need to do your own advance work and qualify the trade show attendees you want to meet. It’s estimated that 81% of trade show attendees have buying authority. Which means more than 4 out of 5 people walking the aisles are potential customers for exhibitors. It is a good idea to send a pre-registration mailer and include a lightweight, easy to mail promo item with your logo and booth number so they can find you at the show. Many shows will sell you a list of registered attendees to contact. A study published by the Promotional Products Association International (PPAI) revealed pre-show mailings with incentives are more effective than mailings without an offer of action. In your mailer, tease your audience with another gift waiting when they visit your booth. Promotional products like custom sticky notes, promotional magnets or the Stylus for Smart Phone personalized with your business information are perfect giveaways. Made with a 65/35 blend of poly/cotton twill. Finished with a rolled hem and safety surged seams that won’t fray. 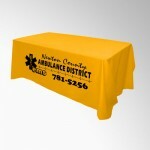 Table cover drapes the top and sides of the table and are cut with rounded corners to give a finished look. Does not require inconvenient attachment clips or accessories. 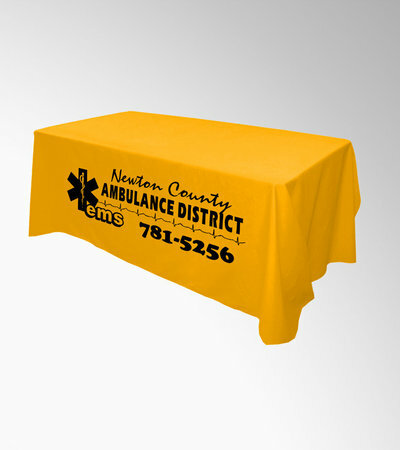 This item can be paired with one of our custom table runners for greater visual appeal. Constructed of a strong, superior, flexible carbon composite material. The pole pockets durable binding gives extra strength. Edges are double stitched for durability. 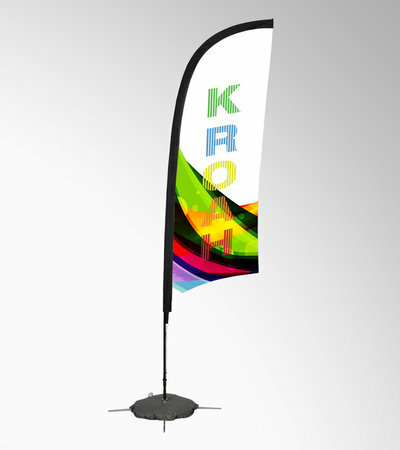 Ball bearing base allows the flag to spin in the wind with less wind resistance. Kit includes hardware, banner carry case and water ballast. 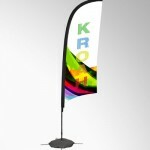 Black double footed base design with 3-piece shock-cord pole offers reliability and stability. 3 mil laminate is added to Dye Sub No Curl Media to protect your graphics from scratching and fraying. Media has a block-out film, so light will not shine through. Easily portable, includes carrying case. 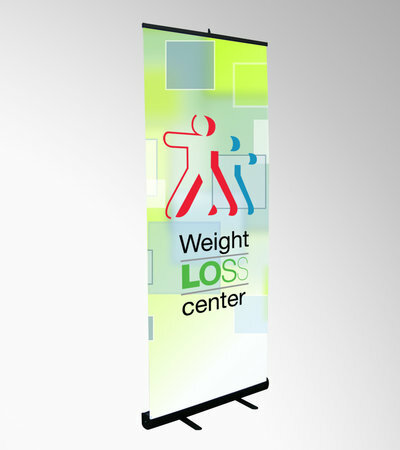 Traditional banners are also great for advertising new products, best sellers or special promotions in and around your booth. 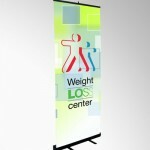 Create one message and develop your graphics, pre-show promotion, literature and show directory advertising around it. Keep it simple. Be sure to adequately staff your booth (a good rule of thumb is to have 2 staff for every 100 square feet of exhibit space). You also want to make sure your staff dresses the part. This is where having the right trade show shirts will make your team look professional and also easy to pick out at your exhibit. Don’t forget to order Women’s tapered cut as required for both your staff and for giveaways. o Not all visitors are the same and should not be treated with the same value when it comes to gifting. o Spend money on an item that is interesting, useful and will create a splash. o Only give items to people who are on your target list and who actually spend the time to be educated about your services. o Choose higher-end promotional merchandise or personalized gifts when your most valuable customers stop by. Make them feel special; not like everyone else. Low cost items are an effective way to increase traffic to your show booth – free stuff is a huge draw for consumers and it is no different at trade shows. Almost 80% of show leads aren’t followed up after the show. To increase your chances of landing the sale follow up with leads and keep the promise of sending information requested. Include an item like the Nico Promo Pen and follow up with a phone call. Plan for all these details and you are well on your way to rocking your trade show. And one last important thing to remember – these shows are a place to make connections and build your business. Smile, enjoy yourself and connect with people on a one-to-one basis and through Social Media throughout the process. Tweet and Hashtag your way success. These tips will allow you to survive and thrive!